Fourteenth Street’s transformation is never more apparent than when you walk into Le Diplomate. 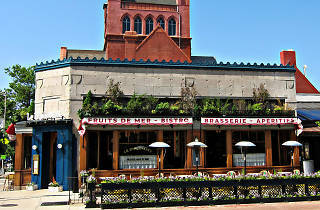 From the globe lights overhead and the wood floors underfoot, to the woven bistro chairs and the curieux that adorn the walls—most everything you can touch or see or even hear in restaurateur-impresario Stephen Starr’s brasserie is literally imported from France itself. Even the name, Le Diplomate, is taken from a Parisian bistro Starr once visited. While some patrons have likened their experience to a trip to Epcot, that hasn’t stopped the 265-seat restaurant from filling up nearly every night since it opened last April—and not just because political royalty such as Michelle Obama and the Biden family have dined here. In other words, word has gotten out that Le Diplomate’s Frenchy fare is fantastic. 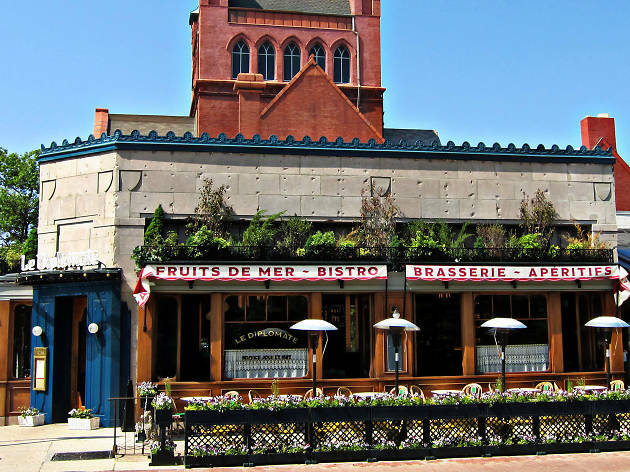 Even with so many great raw bars around town, les fruits de mer are not to be missed. Nor is the steak tartare de parc, which features a tender, sweet filet chopped fine and topped with salty capers and a velvety quail egg. For entrees, the grilled loup de mer is lightly seasoned and served overtop a rich, buttery tapenade and hearty, oversized white beans. If its simple bistro fare you cherchez, the steak frites is a wise choice. Note that your inner-Francophile may have to wait one month for a weekend reservation. In the meantime, hit up Le Diplomate’s brunch, when seats are less in demand, but the food is just as good. C’est bon.